I’ve done a two-part series on preparing your SEO campaigns in 2014, now I want to talk about the paid counterpart: PPC advertising. Many businesses are making the switch from organic search to PPC in line with the growing unavailability of organic search referral data, and if you play your cards right, your PPC campaigns may reach record highs next year. 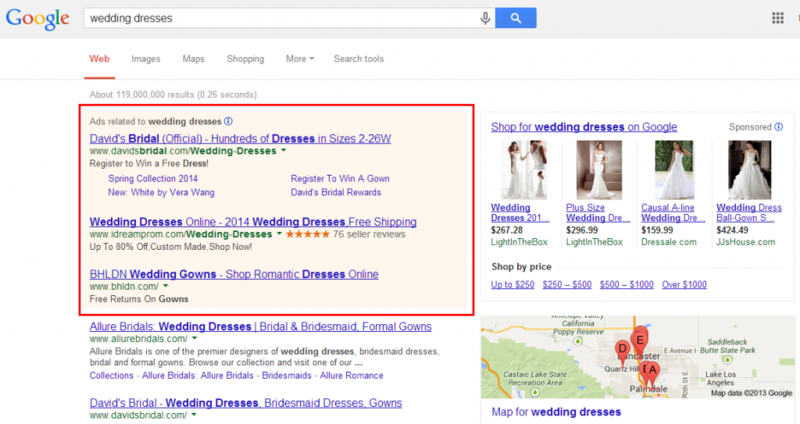 Prepare your PPC text ads (seen in the image) and display ads with the help of these simple tips. Copy. Changing the direction of your copy is the easiest thing you can do, since you change your copy regularly anyway. Study the response of your target audience to different approaches you use – whether it’s descriptive, benefit-centered, or a comparison of your clients’ products / services with their competitors. Call to Action. Sometimes the copy works already, but you lose customers because of your call to action. Make sure your call to action is strong enough, and that it can be clearly distinguished from the rest of the ad. Display Ad Size. Changing something as simple as the dimensions of your display and retargeting ads can make a difference. This is because as their sizes change, their placement also changes. Your retargeting campaigns can benefit from having matching banner ads placed on top of the pages of Google’s Display Network. Display Ad Design. Make sure to use new designs based on the latest trends, on consumer psychology, and on the data you gather about what stimulates your audience from previous campaigns you’ve run. Reasons for going under / over budget: Have you utilized the budget fully? How successful was your bidding strategy? Reviewing these elements helps you find out where the opportunities are and determine if you’ve lost any resources that could have been used more successfully in a different paid ad campaign platform or in a different campaign a specific client is running. It also helps you plan better PPC strategies for the coming year. If you haven’t already done it this year, it’s time to plan a device targeting strategy and incorporate it into your PPC plan for next year. You may have included mobile in your efforts this year, but you’ll have to focus on the data you get and optimize a unique strategy entirely for device targeting campaigns. Mobile CPCs and performance. Compute the percentage of mobile PPC performance against your overall PPC conversions and determine if you can increase your device targeting spend for next year. User behavior trends. Check the most popular locations and time of day for accessing your PPC ads. This will allow you to make the most of your visibility on paid search, reaching your target audience where and when they want your clients’ information the most. Conversion elements. What elements contributed the most to your mobile PPC conversions? Make these the focus of your campaign for next year, and work towards improving the rest of the elements of your PPC campaign. Creating a promotional calendar for 2014 this early will help you plot out your paid ad campaigns and allocate resources early. Brainstorm what you will offer throughout the entire year – discounts, downloadable materials, free trials, assessments and reports – and plot it out on a calendar. This will ensure you have running ads throughout the entire year. We keep our PPC methodology updated to ensure the continued success of your clients’ PPC campaigns. Talk to your account manager today to begin planning your paid marketing strategy for next year. Don’t forget to sign up if you’re not yet our partner to get this solution and more from our complete online marketing suite. Keep checking back for more updates!